Home Numerology Angel Number Meanings Quadruple Digit Angel Numbers Meanings Angel Number 2323 Meanings – Why Are You Seeing 2323? Coincidences happen, but sometimes they can feel like something more. You are woken up early on a Sunday by an unexpected phone call. As you chat, you notice the number ends in 2323. Later you pop out for brunch and treat yourself to a large plate. The total for your order comes to $23.23. After eating, you go into your favourite bookstore and find a new read. As you wait to pay you see that the book barcode ends in 2323. Why is this number capturing your attention today? It could be that Angels are using these digits to send you a message. What could quadruple digit Angel Number 2323 be trying to tell you? What does Angel Number 2323 mean for love? Angel Number 2323 is a repeating sequence of the numbers 2 and 3, with their potency doubled. The number 2 is linked with ideas of duality and balance. It is linked to our relationships, and the way we inhabit different personas depending on what we are doing and who we are with. It relates to the need to be flexible and adapt so as not to break with the wind, while still staying true to ourselves and our course. The number 3 is all about communication. It is about how we use our senses, including our less understood senses, to perceive the world around us and the need to both pay attention and trust our intuition. It is also linked to how we express ourselves and make our thoughts and desires known. Angel Number 2323 suggests that it is through our clear perception of the world that we are able to find our place within it. Have you ever been told that you are a different person at work, or that you seem different when you are with your partner than when you are with your friends? Perhaps this is playing on your mind for some reason and you are struggling to know how to express your true self in all situations. Angel Number 2323 can suggest that you lighten up on yourself. We all play different roles depending on the situation that we are in, it is not a sign of deceit, only of adaptation. As long as you are staying true to your core values, a different outward expression does not change who you are. When working in a team, finding consensus can be a challenge. Sometimes because of hierarchies, people do not want to speak up when they think superiors are making the wrong decision, and will either consciously or unconsciously sabotage the joint endeavour later with their descent in action or attitude. Angel Number 2323 calls you to speak up in the early stages and have your voice heard. You are on the team for a reason and your opinion in valued. However, once the group has chosen their path forward, back it 100 percent. Don’t let a negative attitude undermine it because it goes against what you suggested. Unfortunately, we can’t always trust other people to be honest with us. Sometimes their deceit is simple malice, but at other times it is more complex. Perhaps they are trying to protect themselves from being hurt, or communicating what they want to be true. Angel Number 2323 can be a warning that someone is deceiving you in a way that is significant. It suggests that you use your intuition to discover who, and why. Don’t jump to conclusions, it is possible that they need help rather than condemnation. If you are struggling to come to an agreement with someone about something, it is probably because at least one of you is being stubborn and refusing to budge. Is that person you? Angel Number 2323 lets you know that in this situation, you will need to make some compromises to make things work. It does not suggest that you should fold on anything important, but you do need to find common ground. If you can find a way forward, you will both benefit. It is a blessing to be able to communicate the complex things that we think and feel with others through our words. While words are an amazing tool, like many useful tools, they can also be used as a weapon. We have all experienced when someone has used the exact right words to push our buttons and break us down in some way. The 2323 Angel Number reminds us that the words someone shares with us is an expression of them, and not us, and that we should not let them tear us down. It also reminds us to be mindful of our own words, and not to use them to inflict pain. When it comes to love, Angel Number 2323 is a reminder that communication and understanding is at the heart of any true connection. It reminds us to be honest in our communications and show people who we really are. However, it is more strongly linked with our need to listen. It asks us not to get so wrapped up in what we feel, what we want, and what we imagine the truth to be, that we do not hear what the other person is trying to tell us. If we do not pay attention, we may get a rude surprise that our partner is not in the same place as us. While it is always a blessing to receive guidance from Angels, the complexity of numbers and of our own lives can make their message challenging to understand. In order to figure out how their message applies to you, pay attention to what you were doing or thinking in the moments that the numbers appeared. Angels will reveal their guidance when your challenge is at the front of your mind in some way. Do you seek guidance and insights into the past, present and future, with regards to relationships, love, or money? 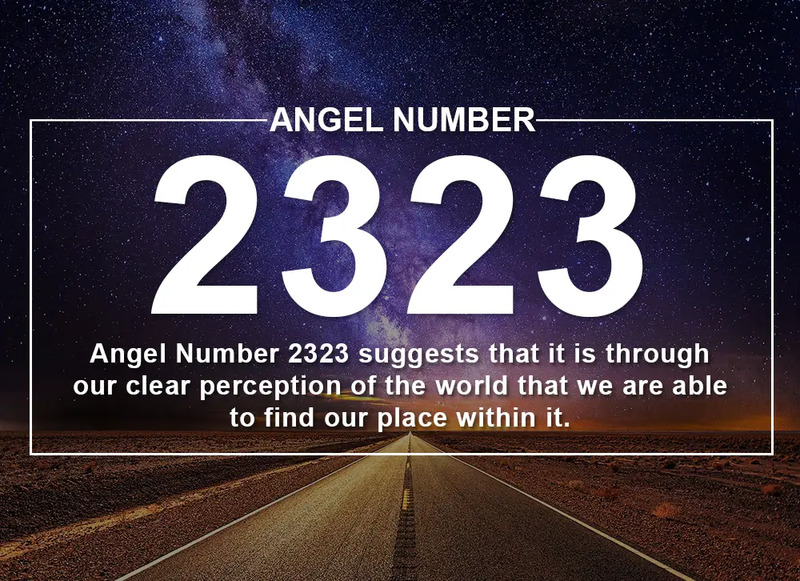 If you are frequently seeing the 2323 Angel Number, take this popular free test to see whether your Guardian Angel is trying to send you an urgent message. Keep seeing 2323 everywhere? Could it be a coincidence or something more? 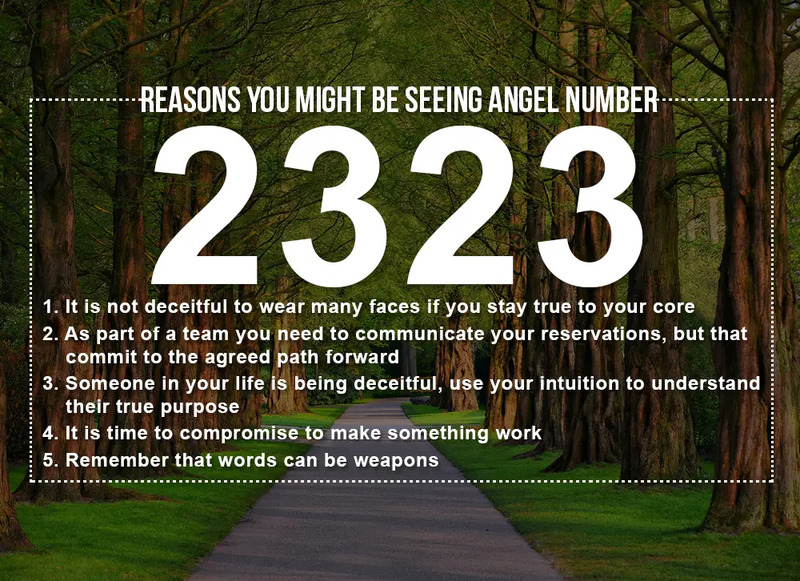 Learn the important meanings of the Angel Number 2323.